Juniperus communis (Juniperus communis L.) is a wild plant. Mature fruits (shishkoyagody) contains essential oil. Extract (10 : 200) take 1 tablespoon 3 times a day as a diuretic. Contraindicated in nephritis, and neproshenyh. Coniferous trees mercilessly kill harmful germs. Juniper, perhaps, champion among them. It allocates volatile production is about 6 times more than other conifers, and 15 times more than hardwood. 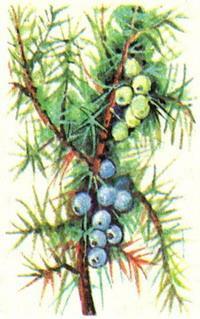 In our country more than two dozen species of juniper. Among them are trees and bushes. Now they all in one way or another need protection. Juniper is very sensitive to air pollution by industrial wastes: many cities around it almost disappears. And junipers grow slowly in most species because of various violations do not occur seed resume.